If the stock drops another couple of dollars, however, it is then officially in penny stock territory. And then it drops off many investors’ watch lists (including mine). 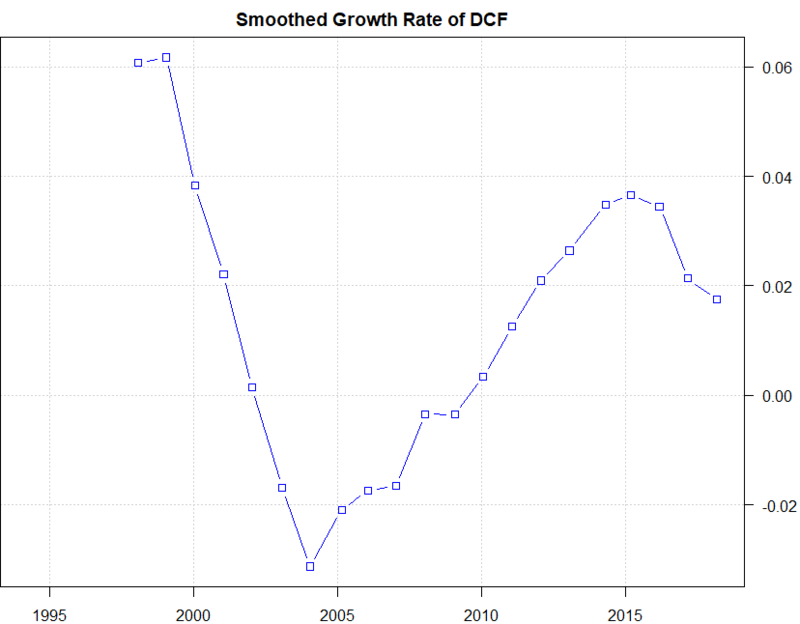 I wanted to check this evaluation with my own discounted cash flow ((DCF)) model. My model emphasizes the annual trend of the DCF valuation rather than the point value and is thus useful for understanding the drift of the underlying financials of the company over a longer time horizon. Let’s start with some of the important metrics used in this model. It flashed a sell signal in 2016, right before the stock crashed. I will be able to update this model in March with annual data. For now, just note that the valuation’s trend has not slowed to where a reversal is likely; if this continues, we should see a sub-$5 valuation in 2019. The company is clearly having hard times. At the same time, it claims to be reinventing its business. For now, few results of such reinvention are palpable; for the most part, “reinvention” seems to be a euphemism for “Don’t sell just yet!” directed at investors. All companies eventually die. As companies age, they become more convoluted and stuck in their ways. Note that GE was born in 1892, which is impressive but not a reason to put your faith in this stock. Many are displeased with the new CEO, as the stock has sunk since his arrival. But GE investors seem to forget that the last CEO wasn’t a rock star either; his retirement announcement boosted the stock price. No, this company has problems unrelated to who’s sitting on the CEO throne – problems perhaps unfixable, even with a strong leader. GE’s capital allocation has not paid off. Its recent acquisitions have been some of its most expensive (e.g., Alstrom, the French turbine company – and former GE competitor) yet they have been unable to bring GE back to its glory years. 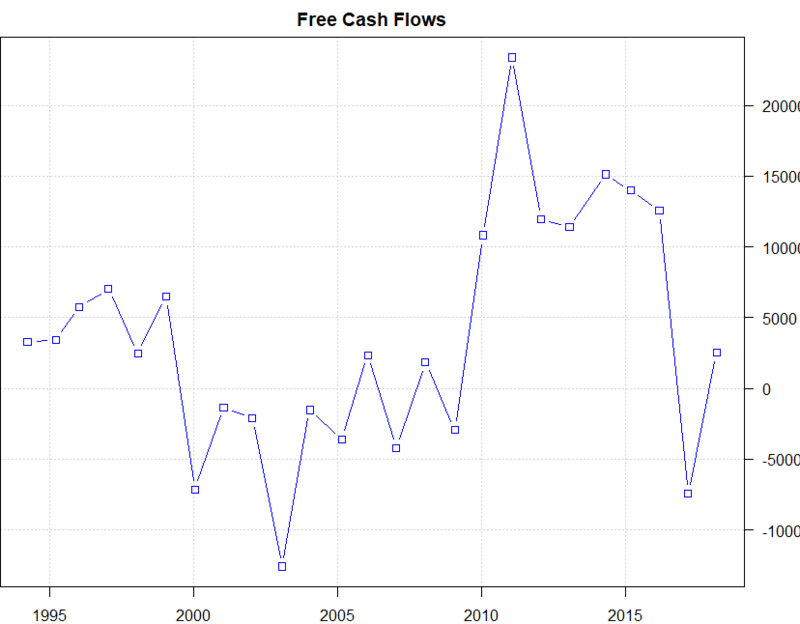 GE has also been aggressively engaging in buybacks. 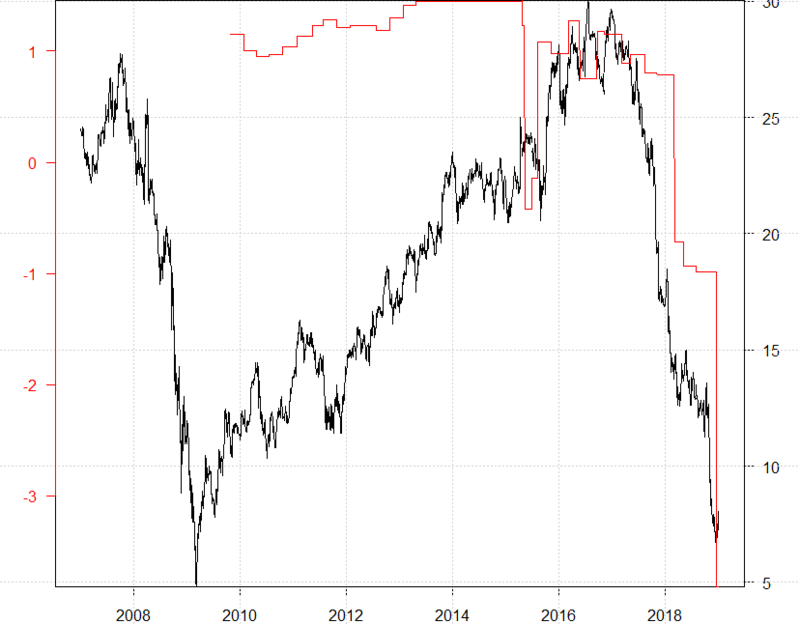 Buybacks make sense when you have excess capital, wish to reduce outstanding shares, and want to bolster the stock price – and only when the stock is objectively cheap. 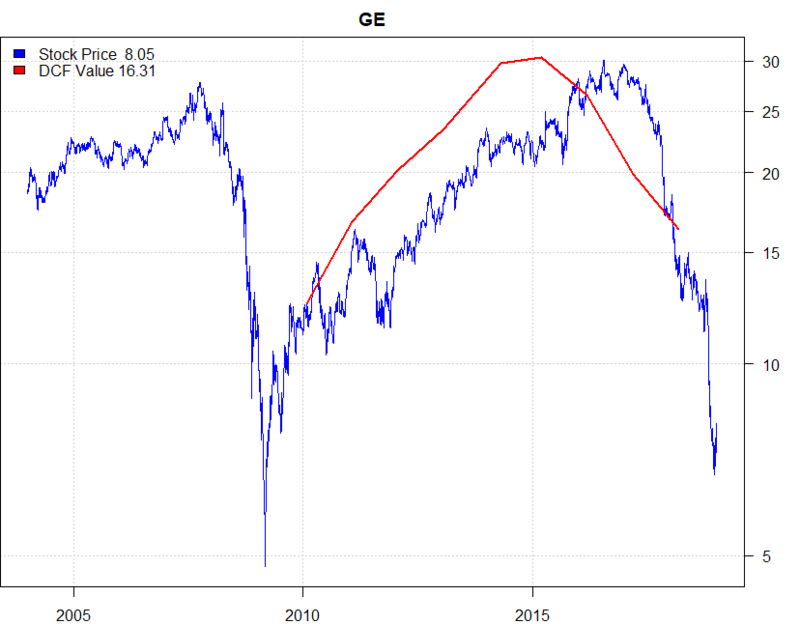 However, we find GE spending most of its $90B buyback budget near the recent peak. Perhaps Larry Culp should take a note from George Costanza and set a goal of -$2 EPS for 2019. He might end up making some profitable acquisitions. 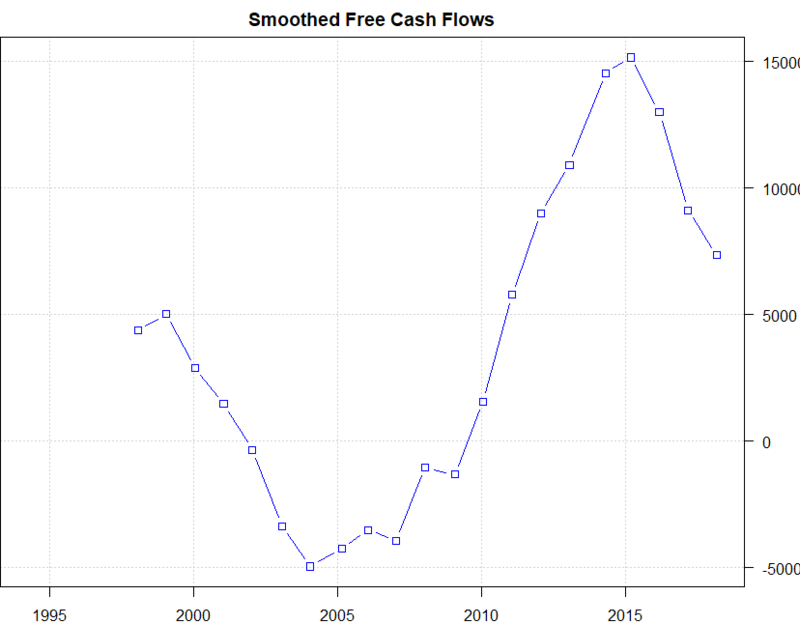 Or perhaps GE is beyond saving at this point. 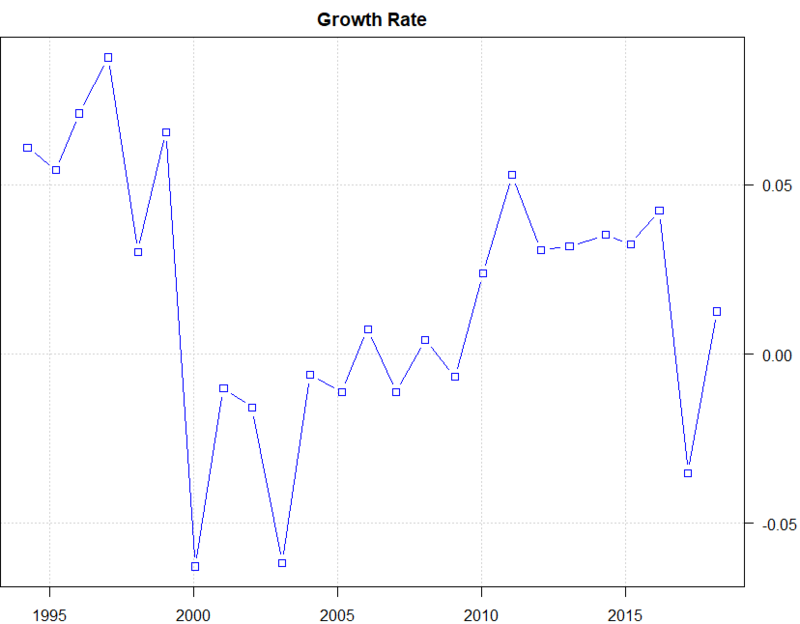 On a more serious note, notice that the analyst range of EPS estimates have historically been above the actual EPS. For this reason, GE’s earnings reports have been statistically reliable short trades. 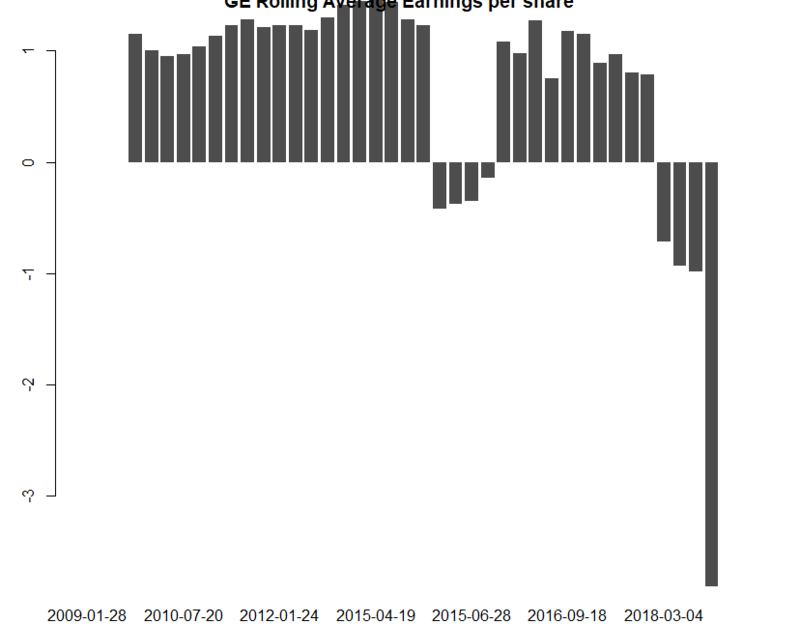 The reason for my interest in trading GE this quarterly earnings lies in its quarter-to-quarter EPS trend. Analysts’ consensus for EPS in the coming earnings report is $0.18. This is highly unlikely. Consider the following. The consensus for last quarter (FQ3) was $0.21. The actual EPS was $0.14. The consensus for this quarter is $0.18, lower than that of FQ3 – but FQ4’s actual EPS is consistently lower than FQ3, implying that the estimated EPS should be lower than $0.14. When the company was doing well, this stock was seen as a defensive holding. 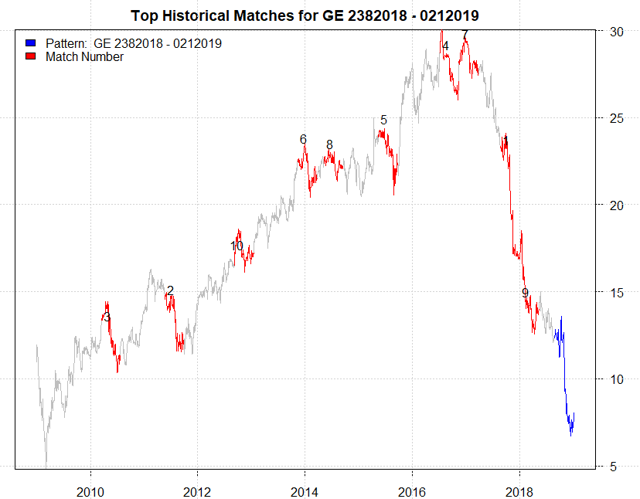 In 2018, GE finds itself delisted from the DOW. The next step is its graduation to a penny stock: The EPS line is gently pointing to where GE needs to park itself. At the current prices for these options, this play is opened at zero cost. Should GE’s CEO release an amazing turnaround plan and report an EPS surprise, GE could rally, but we would lose nothing. I doubt a rally will happen, but we should always be prepared with a contingency plan, such as the above options strategy. Probabilities are Bayesian and weight historic earnings patterns along with AI pattern recognition. Risk/reward measured without respect to probability and weights upside/downside. Warning: Most earnings trades produce a gap. Determining when to close your position upon seeing the gap is imperative. Review my gaps guide.